MUMBAI (Scrap Register): India’s major brass and copper scrap commodities prices dropped on the Scrap Register Price Index as on Friday, tracking the weak trend in copper Futures prices at India’s Multi Commodity Exchange after U.S. President Donald Trump said he did not plan to meet China’s Xi Jinping before a March 1 deadline for the two countries to achieve a trade deal. 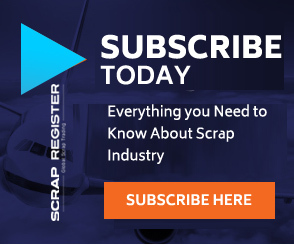 India's major brass and copper scrap commodities prices including Brass Shell 40mm, ACR Copper Coil 3/8, CC Rod LME ++, Copper armature, Copper cable scrap, Copper cathod LME ++, Copper shell 40mm, Copper utensil scrap and Electrolytic Copper strip 25mm prices dropped on the Scrap Register Price Index as on Friday. The most active February copper contract on India's Multi Commodity Exchange has declined by 0.80 percent to Rs. 442.70 per kilogram on Friday from previous close of Rs. 446.30 per kilogram. Copper Futures at MCX touched an intra-day high of Rs. 447.00 per kilogram and an intra-day low of Rs. 442.15 per kilogram during Friday. The news reignited concern that the U.S-Chinese row will worsen, damaging the already weakening global economy and curtailing metals demand.